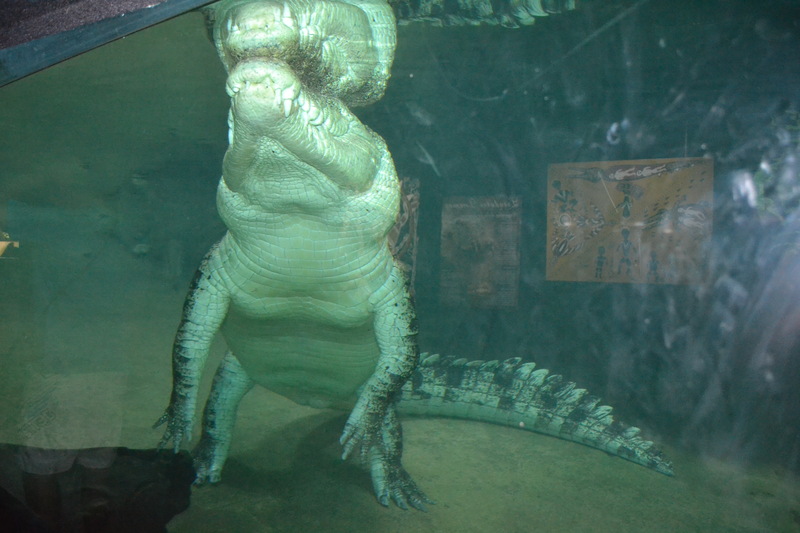 Have I mentioned before that anyone who comes to the Top End is obsessed with crocodiles? Yes, you’re right, I’m sure I have. 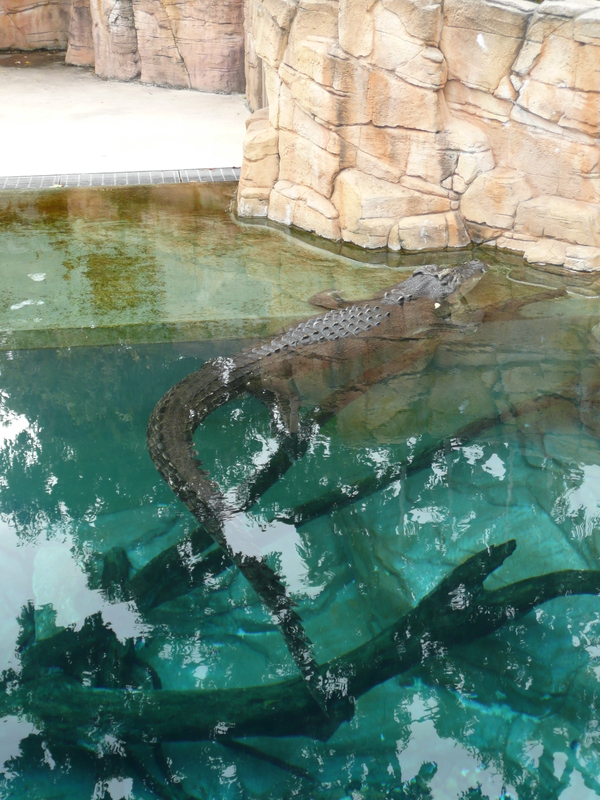 This saltie (saltwater crocodile) was languishing in one of the aquarium tanks at the Wildlife Park recently, and from the surface you’d have been flat out seeing him…barely anything visible. You wouldn’t even get a chance to smile at him in the wild, before he’d be on top of you, taking you for a death roll then stashing you under a tree root/branch for a lunch smorgasbord later on. And just because they’re called salties doesn’t mean they aren’t in freshwater.That’s why all those warning signs are around the Top End’s waterholes. Oh and did I mention that the tally of crocs taken from Top End waterways and the harbour reached 185 on 28 July? It’s not taking a photo a day that’s a problem…it’s getting organised to upload them when life gets busy. This week has been all about sorting and tidying and finding some papers that went AWOL so photo uploading went by the board. Given this is a Territory blog, and taking a leaf from the local rag newspaper, what’s a week without a croc story. Given there was a cool breeze and it was a balmy 21C earlier this week, I took Master Almost-Three to Darwin’s Crocodylus Park (not Crocosaurus where we went the other week). I thought it would be a change to see the monkeys, lion and tigers but was disappointed to find no sighting of the tigers (I think one died of old age lately but I did think there were two -perhaps I misremembered) and the lion and ocelot were having lovely naps in the sun. The monkeys were full of life, moving from pillar to post…a little like the three year old. He’s no longer scared of the crocs so we had a look as they tried to encourage one to jump to take his morning snack but his little croc heart just wasn’t in it…too well fed obviously. On the way out the crocs were sunning themselves with their mouths open to cool down. 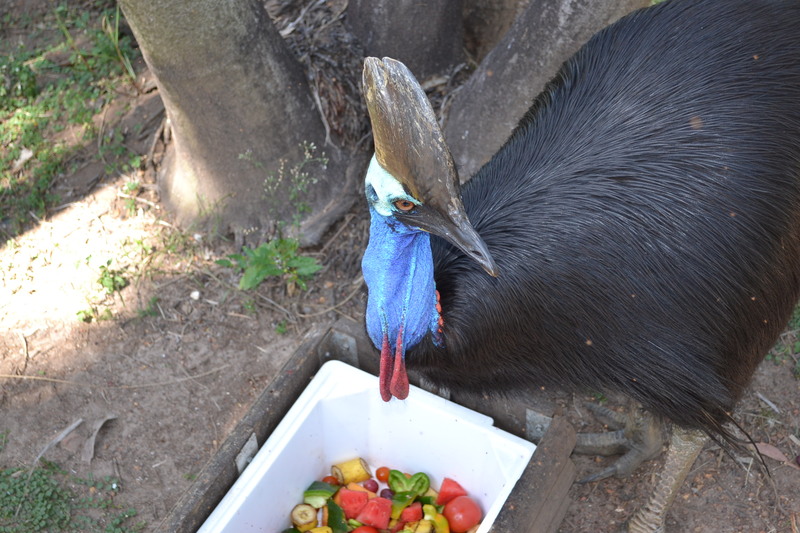 Have you seen a Cassowary? They come from Far North Queensland, and can do incredible damage with their vicious kick if you provoke them…best to give them a wide berth in the wild. 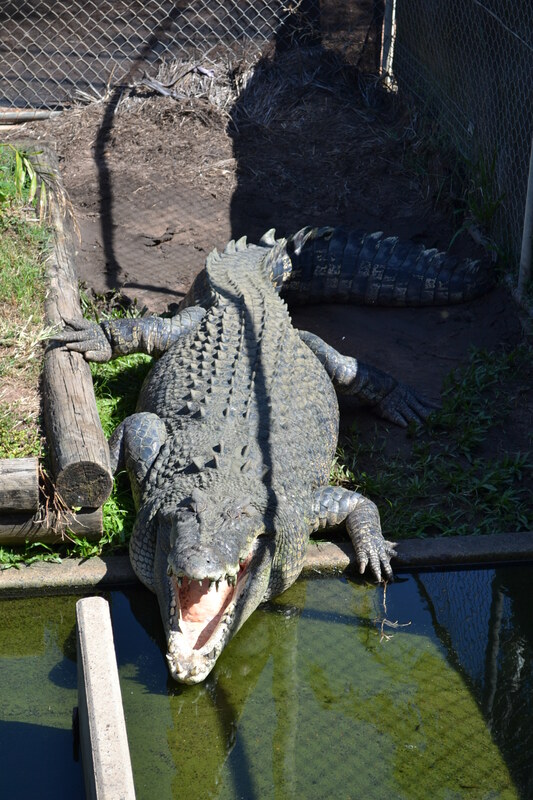 On Tuesday we went to Crocosaurus Cove in town to see the crocs and snakes because my grandson loves to see the critters. He also calls it Crocodilesaurus…or does he mean Crocodile Saw Us? The Sun Princess cruise ship was in town so there were quite a few tourists checking out this tourist venue. Personally I’ve never seen the big attraction to crocs but it seems I’m on my own with that view. We had a good outing and weren’t there all that long as Small Boy visits quite regularly. Anyway I thought I’d share some of the Crocosaurus Cove residents with you. He doesn’t look large in the water but he’s about 4.6metres. You wouldn’t want to meet him in the water anywhere. 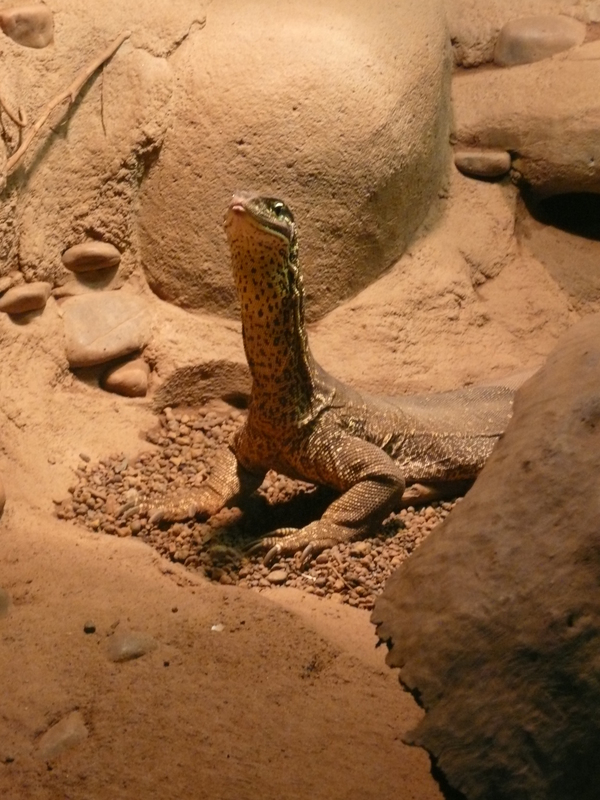 Mr Goanna checks out his company. 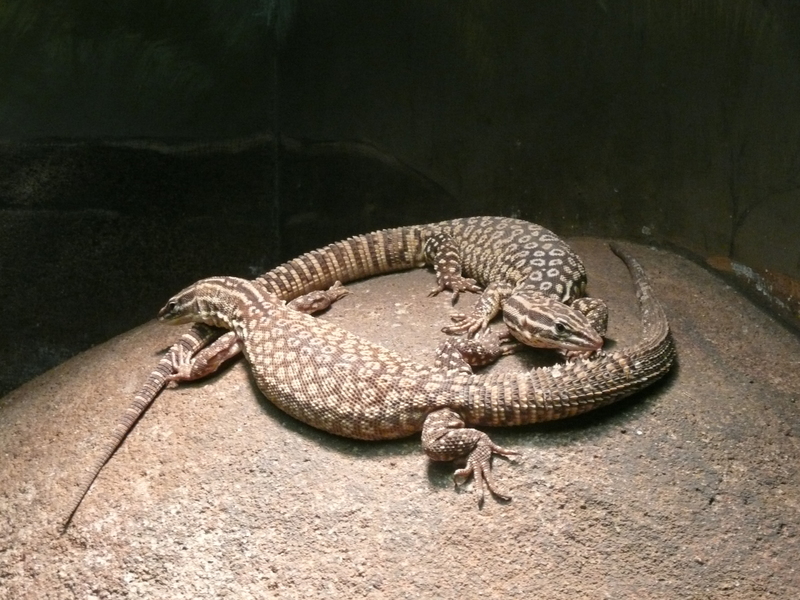 I think these were small sand goannas but I didn’t take a note of their name.